PDF Pattern #SS1850-01. 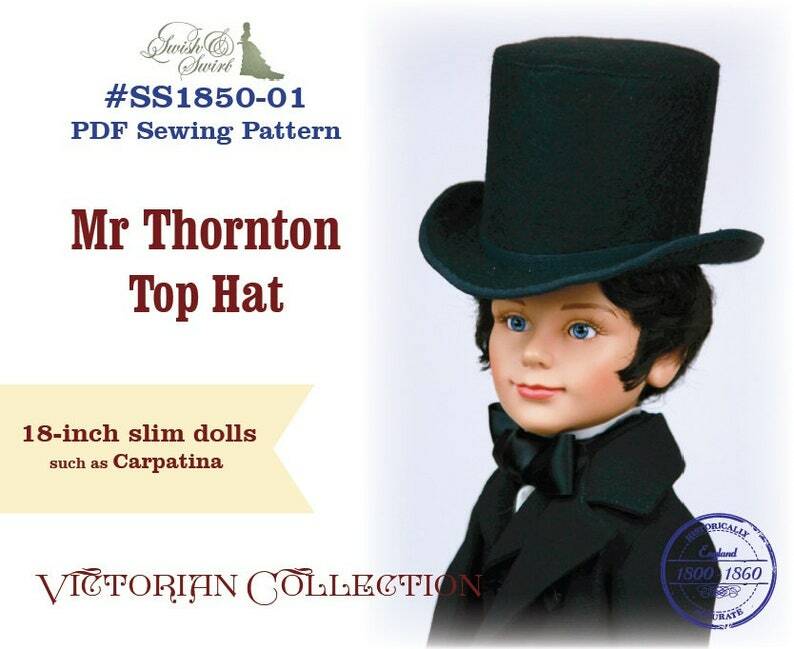 Mr Thornton Top Hat designed to fit slim 18-inch Carpatina boys and similar dolls. Your 27 page PDF PATTERN will be available for an instant download once payment is confirmed. Look for the "download" link on your order page. No paper copy will be mailed. PDF Knitting Pattern #SS2016-K09. Rainbow Top for 18-inch slim dolls like Kidz'nCats, Carpatina, Zwergnase Junior. PDF Knitting Pattern #SS2016-K04. What a Hoot! Owl Sweater for 18-21-inch slim dolls like Kidz'n'Cats, Carpatina, Gotz, Zwergnase Junior. PDF Pattern #SS1940-01. Nancy 1940s Underwear for A Girl for All Time dolls. PDF Pattern #SS2016-04. Tropicana Skirt and Halter Top for 16-inch A Girl for All Time dolls. PDF Knitting Pattern #SS2016-K21. Elsa Hat and Scarf for 18-21-inch dolls like American Girl®, Gotz, Kidz'n'Cats, Carpatina. PDF Pattern #SS2016-02. Madeleine dress for 18-inch Kidz'n'Cats dolls.